LCD displays are a perfect choice for indoor digital signage requiring full HD performance at ultra close viewing distance. They are widely served for business, finance and nonprofit organizations, public places, real estate properties, entertainments, etc, delivering continuous, reliable performance 24 hours a day, 7 days a week with stunningly dynamic video and audio presentations. 1. 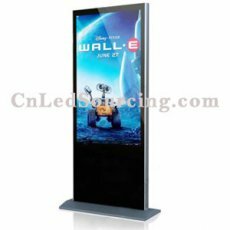 Full HD, 1080P LCD screen, supports display ratios of 16:9, 9:16 (horizontal/vertical), etc. 11. Equipped with built in speakers and abundant input ports like HDMI, VGA, etc.